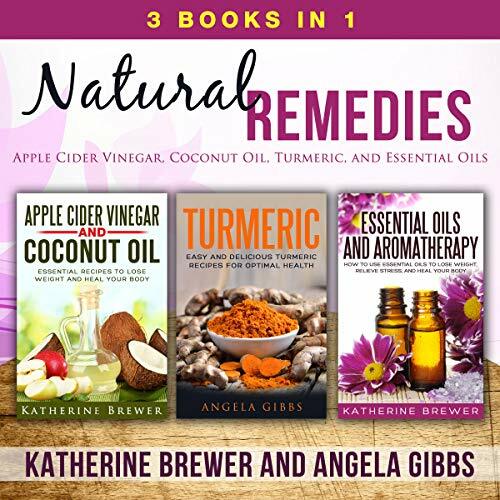 Natural remedies: three audiobooks in one. There are numerous benefits for items traditionally found in the pantry. Apple cider vinegar and coconut oil are two such items that are not only called for in recipes as flavoring agents, but also have many uses outside of the kitchen. Apple cider vinegar and coconut oil have active components that can fight off bacteria, fungus, and yeast and even regulate metabolism. People who use apple cider vinegar and coconut oil on a regular basis report having fewer digestive issues, weight loss, and a healthier appearance. Turmeric is an ancient spice that is native to Southeast Asia, especially India. It is used as a condiment in popular Indian and Thai cuisines. Turmeric has a centuries-old medicinal usage treating many common ailments and diseases. For instance, turmeric is touted as a strong antioxidant in preventing cancer, while its anti-inflammatory properties can lessen suffering from inflammation and arthritis. Consider adding essential oils to your basket of home health remedies, and start gathering a collection of these high-powered (and great-smelling!) oils today.